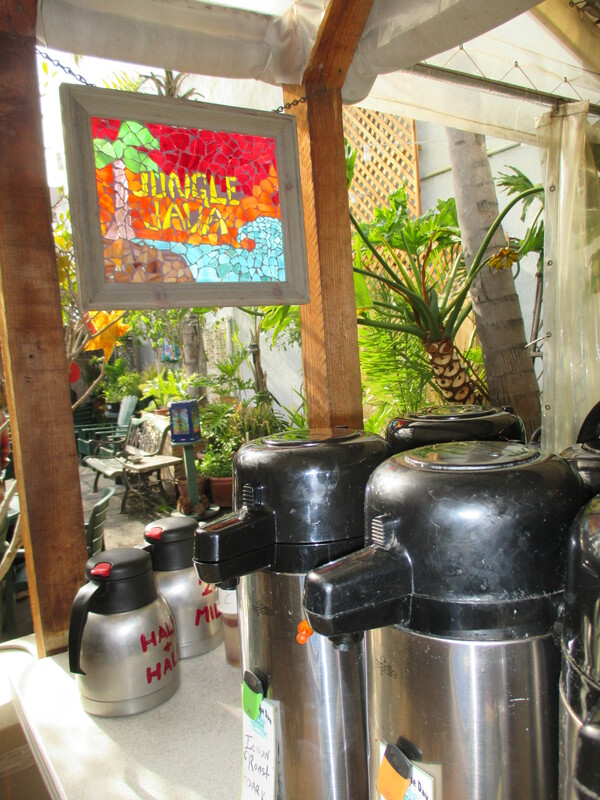 Jungle Java is a blast from the past. Wedged between two buildings, this open-air, groovy spot serves up coffee in a funky surrounding of succulents and other potential gifts. Pump your choice of coffee and settle back into the 1970s. Caution: Smoking is permitted. It’s cash only and there are no bathrooms, but there are public toilets nearby at the beach. It’s an outdoor space, so it’s probably not the best choice for a rainy day. Wednesdays from 4:00-7:00 is the Ocean Beach farmer’s market just up Newport, so parking might be tight. Still, even with a few drawbacks, Jungle Java has become one of my favorite spots to hang out, sip great coffee served by friendly employees, and people watch. And, you might consider treating yourself to a scone. This entry was posted in Coffee shops in San Diego, near the beach and tagged Ocean Beach, outdoor cafe. Bookmark the permalink.